Following pickup from Brisbane Transit Centre, Mantra On View Hotel, or Big Pineapple Nambour on the Sunshine Coast, travel to an eco-friendly resort located on the beach, stopping at a reptile park and zoo on the way. From the resort, spend a day cruising to and experiencing the Great Barrier Reef and Lady Musgrave Island, where you can add activities such as scuba diving or deep-sea fishing, or view the coral reef while snorkeling with provided equipment. . Spend two nights in your choice of a private room or shared accommodations. Each day, you can choose from included and optional activities, or opt to enjoy the beach and some free time. See Itinerary for more details. Please note: Pricing does not include reef tax and boat access fees (AU$210 per adult, AU$120 per child). Meet your coach in the morning at a central location in Gold Coast, Brisbane or Sunshine Coast and head north. Stop and visit Snakes Downunder Reptile Park and Zoo. Catch sight of the Glasshouse Mountains as you go. Visit the family-run Mammimo Gourmet Ice Cream. Sample fresh ice cream or sorbet (own expense) as you watch a farm demo about sugarcane production (seasonal). Once you've checked in and put down your bags, choose from several activities for the afternoon. Try surf lessons (own expense) or join a free guided snorkel school. Lounge and swim at the beach or pool at your leisure, visit the world's largest turtle research center (April to October), or experience the Mon Repos Turtle Centre (November to March). In the evening, have dinner at a local café or restaurant, then enjoy the nightlife on site or a walk on the beach to look for shooting stars. 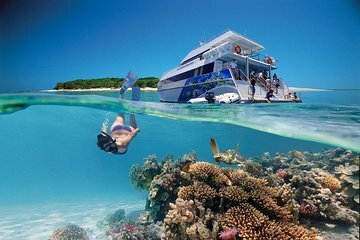 After breakfast, hop onboard your boat and cruise to Lady Musgrave Island, situated on the southern part of the Great Barrier Reef. This area is known to be free of stinging jellyfish. After about an hour-long ride, arrive at Coral Lagoon. You have several options for your day. Swim among the amazing coral and fish with the provided snorkel gear, and take a trip by glass-bottom or enjoy a guided island walk with commentary. Keep on the lookout for whales (in-season) and turtles. Both beginning and certified divers can explore the diversity of marine life on the Great Barrier Reef; meanwhile anglers of all skill levels can attempt to reel in some fish with provided gear. Enjoy a provided lunch, morning tea, and afternoon tea on the boat. If time and weather permit, you’ll be treated to a sunset tour. Afterward, enjoy dinner at a local café or restaurant and then enjoy the rest of the evening on your own. Check out of the resort after breakfast and head to the beach for some fun in the sun. Take an optional surfing lesson (own expense), swim, or snorkel, depending on the conditions and timing. Afterward, get back on the road. You return to your starting point in the evening to end your tour. The trip is worth the money. Harry is a great guide and there is always plenty of food. The team on the boat is great and Lady Musgrave Island is beautiful. Lady Musgrave island is spectacular! Saw humpback whales in the way in and out. Chris was a great guide! Engaging and interested in everyone’s story. Kept us moving and on time. Made fun new friends! We took this tour July 9-11th and the weather was perfect! Harry, our 'Nemo wrangler', was a terrific tour guide, who went out of his way to make sure that everyone on our tour- we were an eclectic group!- got the most out of our experience. The accommodation at Kelly's Beach resort was rustic but enjoyable. The one downside- as others have noted- is that the boat trip to or from the Reef just under 3 hours can be very bad- our trip back after such a lovely day on the Reef was absolutely the most brutal boating experience we have had- even with 100mg of anti-nauseant tabs taken in advance, I was gagging and almost everyone on board was ill. I suspect that forewarning may preclude folks from taking this trip but I would suggest it. Thanks to Harry, our trip was amazing and worth every penny and gag! Loved it! Was a bit annoyed about some of the scuba diving experience - bit overall, great experience. Amazing trip. Harry was such a great tour guide. Really engaging, informative and definitely keen on ensuring all guests were getting the most out of their trip. All the stops were great. Snorkelling in the reefs, seeing sea turtles hatching at Mon Repos and surfing with Enviro Reefs Paddle and Surf School were definitely the highlights for me. This was one of the best trips, if not the best, that I've ever taken. I HIGHLY recommend this. There are three parts to this tour: snorkling, an island walking tour, and a glass bottom boat ride. Try to get in the water during the lowest tide available that day. At higher tides you will spend a lot of effort trying not to hold your position, which distracts from watching the fish. At low tide, the reef pops above the surface and the strong current pretty much disappears. They assign you to groups on boarding, so I am not sure what it would take to change to a lower tide group. Also, wear plenty of sunscreen, reapply frequently the sun is amazingly intense and TAKE SEASICK MEDS. It's a rough ride out and back without them. this was an amazing trip. Harry was a fantastic guide so helpful and friendly. I would recommend your company to anyone travelling. Thank you for a wonderful time.